Early on New Year’s day I took this picture of the small blue pot of Ivy on the kitchen counter, next to the sink. Each morning as I fill the Keurig for a cup of coffee, I give a little water to the ivy. New Year’s morning I transplanted a sister piece of the small batch of ivy, which had been rooting in a clear glass vase on the window sill, a fitting thing to do on a New Year’s Morning, I thought. It took a while to root, as my Mother would have said, as the window faces north rather than a southern window on the other side of the house. We’ve only been in this house four months, and the ivy I rooted on the window sill gave out abundant roots in the two months it had been sitting in the glass vase, under my daily watchful eye. Rooting a small stem of a plant, the way my mother did, always fills me with wonder, being able to coax life out of a plant. When I was a child there was always a piece of greenery in a glass vase on a small table in our living room. Even though this glass vase I use now was my mother’s, she used a different vase, a small cut glass pitcher I loved, but one that was broken years ago. Yet she and I never talked about plants or flowers, or our love of gardening. I find this strange because as a little girl I’d wake summer mornings and wander outside bare foot in my night gown, in Pensacola, Florida, looking for my mother. I usually found her sitting in the grass beside a flower bed, weeding before it got hot, she’d tell me. Now, so many years later, I understand that sense of being one with the earth, of giving the flower beds whatever they need to grow and thrive. In a sense they needed her, as mine now need me, or my husband. They need weeding. They don’t care who does it. Knowing my mother, she would wake up the way I do now, wondering each morning if the ivy had any new leaves, or if the gardenias in the back yard had decided to bloom. We had camellias that bloomed year round in our Pensacola yard, as they do here for us in our new Georgia yard. There are always rose-colored camellias or ivory colored gardenias to put in a vase. But it’s different with the ivy. The ivy brings back so many memories of my mother and her life. I know now that my mother thought of her gardens when she woke each morning, to push other problems aside. She would tend her gardens until the rest of the house woke up and life called out to her, reminding her of problems she could not resolve. As for me, I wake up each morning now, as I am sure she did, ready to open the back door to the cool morning and sit down to weed a flower bed, trim pots of ivy, or dead head a few azalea bushes, thinking of my mother and the life she lived. I wonder each morning if she was ever really happy. Did our family let her down? Or were her expectations unrealistic? My brother never had his own company; I never became a novelist. My father stayed, unhappily, but died early, leaving her alone the last fifty years of her life to manage the house, yard and my little brother after I’d married and moved. The only constants in her life were her flowers. As I watched her each morning in the garden, it never once occurred to me if she might have been thinking of her mother the way I do now. It never occurred to me that she had ever read Whitman, remembering that he always had ‘large & melodious thoughts’ while walking under certain large trees. It seemed only a communion with nature when I read that line in college, a line I’ve never forgotten. Never once did I connect this love of nature to my mother, and yet here I am, thinking ‘large and melodious thoughts’ as I transplant a newly-rooted piece of ivy into the pot that already holds another piece I’d transplanted early on when we moved here. I touch the sparkling rocks I placed beside the ivy, rocks my husband brought back from one of his first kayaking mornings here in a nearby lake, and realize I am fortunate to still have my husband here, sharing our new yard in Georgia. Recently I read a blog post by Julie Christine Johnson, with comments of each of the books she’d read this year. I, of course, am miserable at remembering details accurately (my friends will tell you this is nothing new) but she spoke of a book that mentioned a ‘third thing’ that seems necessary for anyone in a relationship to be truly happy. There are always two things which unite a couple, of course – but to thrive and be truly happy about sharing lives together they need a third thing they can fall into and love together. For us it’s our yard – the trees, our garden and occasional flower beds, the way we make plans for them, tend them, plan their futures, the way couples plan for their children. Dinner table discussions between us revolve around fencing – to fence or not to fence, what to plant for a wind break around the back garden, which is being planned in a starkly open yard with no trees yet for company, at least none that give relief yet from wind or brutal sun. And so it goes around here. The yard. Our first love together, especially for a second marriage. Of course I have my children, friends, writing, while he has his shop, tools, kayaking; we have each other, but the love of our shared lives centers around the yard, that third thing we love together. I realize my husband will care as much as I do if the ivy roots in the glass vase on the kitchen window sill and for that I am thankful. My mother never had a husband who cared about the things she cared about. My bother never cared, either, nor her parents. I never knew any of them to root small stems of plants on the window sill. But she had me as excited about her plants as she was, yet we never talked about the ivy, gardenias, camellias, her dreams or her love of gardening. 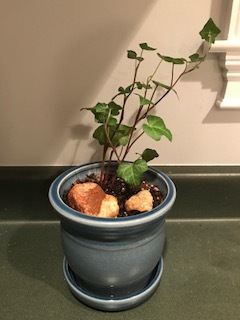 Sometimes when I look at this blue pot of ivy on the window sill, I am filled with both love and sadness for my mother and for myself, on many levels. I see different shadows when I look at it, depending on the light from the window. I see shadows that remind me of a past and a sadness that still lives in my heart. I also see sunlight slanted towards the window, reaching for the light, and realize that we all have a choice as to how we will view our lives – dwelling on the shadows or seeking the light, wherever it leads us. I am sad for my mother’s life. It was not a happy one, and for years I asked myself what more I could have done for her. But now I know it was her choice to dwell on the shadows. I do not want to make that same mistake. Each morning I say a prayer for her soul to rest in peace and to know how deeply she was loved. Then I check the glass vase and rejoice at the light it casts into our lives now. I hope I can always have a plant rooting there, on the window sill, beside the sparking rocks in that sweet blue pot. It tells me all I need to know about life. Ruth, amazing writing. You should submit it for publication to Real Simple or another publication. It really spoke to me. Yes, beautiful writing, indeed. A lovely post. Thank you for reading and your kind note. I am trying to get back to my writing after … you know … life interruptions. Sigh. IT means the world to me to find someone who is moved by my writing. 🙂 Am working on my first novel, but it’s been in the hopper for a long, long time. Maybe one of these days it will see the light. Fingers crossed.